​Based on many years of experience working with parents and children of all ages, Dr. Sandy Gluckman has observed that there is a problem-free child with a healthy spirit, body and brain, trapped behind the layers of learning, behavior and mood symptoms. She believes that every child with these problems, is actually capable of learning more easily, behaving positively and feeling good. Dr. Gluckman describes a healthy and safe way of freeing this uniquely talented child. You will learn how to use your relationship with your children as a powerful healing tool. Dr. Gluckman teaches that when parents know how to connect with their children in a calm, real and intentional way, this changes the brain and has a healing effect. 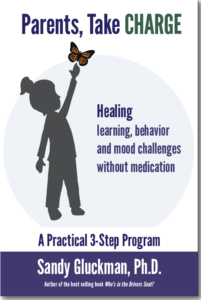 In this book you will learn exactly how to connect with your child in ways that activates healing and healthy brain chemistry. The book is written in an easy-to-read, engaging way, complete with illustrations that demonstrate the hands on tools. It is filled with research, information, stories and case studies that bring to life the benefits of her Healing Parent Program. "I cannot put this book down. Finally someone is writing something that will actually help frustrated parents. I felt like I was reading about my child exactly! My family has been caught in the vicious cycle of watching my daughter get stressed, get sick, go to the doctor, get medicine, recover and then do it all over again. No one was helping me figure out what's causing this- the asthma, allergies, infections, stomach aches, headaches, and the stress! I now feel like I have a way to help my daughter feel better about herself, gain confidence and re-balance herself so she can fully participate in life and get off this merry-go-round. All parents should read this book!"